The big opening this past weekend was the new, sort of live action Jungle Book from Disney. The movie opens in the middle of the action. Mowgli (Neel Sethi) is running through the jungle with his wolf brothers in an exercise to increase his jungle skills. Bagheera catches Mowgli easily and teaches him a lesson. From there and a drought, the law of the jungle says that the lone watering hole is under a treaty and all the animals of the jungle can drink there without fear. Along comes the tiger Shere Khan who insists that he be allowed to kill the man-cub. From there, the story becomes one of Mowgli being allowed to live in whatever way he can, while Shere Khan insists on killing him. Even Mowgli leaving the jungle forever to live with his own species is not good enough for the tiger. There’s actually a lot of backstory that is not given out right away. 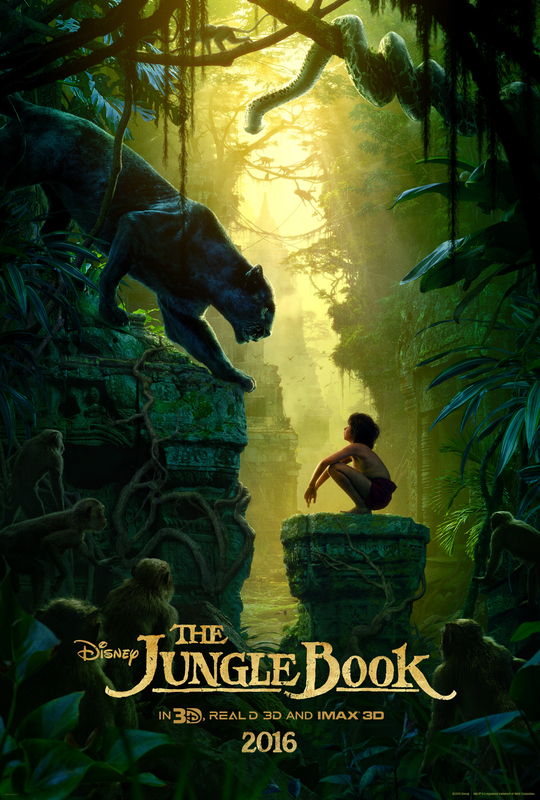 How Mowgli got into the jungle in the first place, and why Shere Khan might have a special hatred for the boy on a personal level, are given out with a single info-dump part way through the movie. It largely works. So do the special effects. None of the animals or even the trees in the movie were real. Everything was done on a computer screen with one noteworthy exception (Mowgli himself naturally). Creating some of the most realistic animals I’ve ever seen, the movie manages to give the animal characters faces that are as expressive as their species will allow. Wolves, for example, aren’t over expressive animals, but I felt some real sympathy for Mowgli’s adoptive mother whenever she was onscreen and Shere Khan was threatening her cubs, adopted or otherwise. Part of that goes to fantastic voice work from Lupita Nyong’o, which is making me start to wonder if between Raksha and Maz Kanata, is she becoming the next Andy Serkis? Say, Warner Brothers is also making a Jungle Book, and it’s being directed by Serkis. Coincidence? I think so! But really, all the animals come off very well, even a more colloquial-speaking Baloo voiced by Bill Murray. The gigantic King Louie (Christopher Walken) may be all the more terrifying due to the fact he comes across almost as a mob boss in the jungle. Idris Elba’s snarl fits in well with the angry Shere Khan, even in the quieter scenes where he isn’t overtly threatening anyone. Plus, the late Garry Shandling was a porcupine. I’m actually surprised given his recent death that Disney didn’t make more of that fact. Aside from one big speech, Kaa (Scarlett Johansson) may have had less lines than Shandling’s Ikki. Ikki almost certainly got at least as much screen time. The movie wasn’t flawless. While Baloo’s “Bare Necessities” seemed to be worked seamlessly into the narrative, fitting Baloo’s general lazy attitude and fun-loving ways, King Louie breaking into “I Wanna Be Like You” seemed a little out of place in an otherwise non-musical version of the story. And make no mistake: this is a remake of the Disney version. Disney Studios made changes to Kipling’s original. Kipling wrote of Mowgli running around naked, and that won’t do for a Disney movie. Likewise, King Louie was an original character for the film, and Kaa in Kipling’s work is actually a wise friend to Mowgli and the others, not an animal looking to make a meal out of the man-cub as seen in either Disney film. But the other weakness in the film was Mowgli himself. It’s hard to find a good kid actor, and Disney and director Jon Favreau are to be credited with finding a kid of Indian descent to play Mowgli (too many studios might have just grabbed a white kid and been done with it), and while Neel Sethi has his moments, he isn’t the strongest kid actor out there, and he has to somehow carry the movie as the only live creature on screen for most of the movie. Not every kid can be Jacob Tremblay, but at least Sethi is a lot better than Jake Lloyd. All these factors come together for a rather satisfying whole when all is said and done. I’m giving it a solid eight out of ten wolves that sound like Gus Fring. I’m not sure how well the movie will hold up to repeat viewings, but I found it a fun way to spend two hours.